What is the REFOCCUS© Marriage Enrichment Inventory? Who should take the REFOCCUS© Marriage Enrichment Inventory? Can the REFOCCUS© Inventory be used in a group? Must a couple meet with a Facilitator to complete the REFOCCUS© Inventory? Why does the REFOCCUS© Marriage Enrichment Inventory have 5 areas (Marriage as a Process, Intimacy, Compatibility, Communication, and Commitment)? What is the FOCCUS Pre-Marriage Inventory? The REFOCCUS© Marriage Enrichment Inventory is a growth and enrichment tool, which can be taken by a married couple at any stage of their marital relationship. Who should takethe REFOCCUS© Marriage Enrichment Inventory? The REFOCCUS© Marriage Enrichment Inventory is designed to help married couples think about, understand and discuss their marriage. By itself, the REFOCCUS© Inventory does not measure the quality of a couples' relationship; rather, it helps affirm what is strong in the marriage and helps couples explore areas ready for growth and/or problem solving. Because some couples prefer to study their relationship alone and others prefer to take the inventory and then participate in discussions that are guided by a group leader, the REFOCCUS© Marriage Enrichment Inventory can be taken by a couple on their own or administered in the context of a marriage enrichment class or discussion group. To use REFOCCUS in a group setting, the group leader provides each couple with the six REFOCCUS questionnaires during a weekend retreat or over the course of several evenings. The leader scores each couple's responses in the absence of the couple and then utilizes the REFOCCUS© Guide for Couple or Group Discussion to facilitate the couple's discussion of each area in a couple-specific or group setting. Why does the REFOCCUS© Marriage Enrichment Inventory have 6 areas (Marriage as a Process, Intimacy, Compatibility, Communication, Commitment and Ministry Marriages)? Each of the six areas has been proven important to the ongoing health of a marriage. The REFOCCUS© Marriage Enrichment Inventory, recognizes that, in an ordinary, growing relationship, a couple experiences not one but many different marriages to each other throughout various life stages. The REFOCCUS© Marriage Enrichment Inventory is designed to help couples look at their relationship at the current moment, recognize the unique dynamics within and outside the relationship that have affected the growth process, and explore the patterns in their marriage that they might wish to affirm or modify. 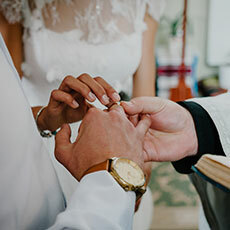 As an important key step in the marriage preparation process, the FOCCUS© Pre-Marriage Inventory is used by engaged couples who are beginning their discussions with a trained FOCCUS Facilitator. The Facilitator arranges for couples to take the FOCCUS© Pre-Marriage Inventory on paper or on-line from any computer. Couples respond to items on the inventory, which are sorted (upon scoring) into nineteen categories. The couple's patterns of responses help identify the challenges and strengths they are bringing to their marriage and provide focus and direction for their discussions in meetingss with their FOCCUS Facilitator. Find out more about the FOCCUS© Pre-Marriage Inventory.